We can ﬁght so hard with our challenges. We feel an urgency to crack the code to our dilemmas, once and for all. Our rigorous efforts have an important place—yet, sometimes we rely so much on our own tenacity that we cut ourselves off from other sources of strength, peace, and renewal. We get caught up in trying to wrestle with elephants—the unyielding difficulties in our lives. I can relate to this personally. For some time, I have felt troubled about certain aspects of my religious life. These tensions began to reach a critical point this past fall, and I knew that things needed to change. So I worked harder. I read a lot. I talked with people whom I trust. I wrote about and pondered di fferent viewpoints. I prayed. Yet for all of my sincere efforts, nothing became more clear. My confusion remained. In my striving to ﬁgure things out, I had unintentionally allowed my spirituality to become deﬁned by struggle and rigor. While caught up in “wrestling the elephants” of my questions, there wasn’t much room left for renewal or peace. More recently, I’ve remembered that sometimes there’s a better way than to keep struggling—and that better way is to relax and to trust. When I take my kids swimming, sometimes I’ll work on helping them learn how to ﬂoat on their backs. 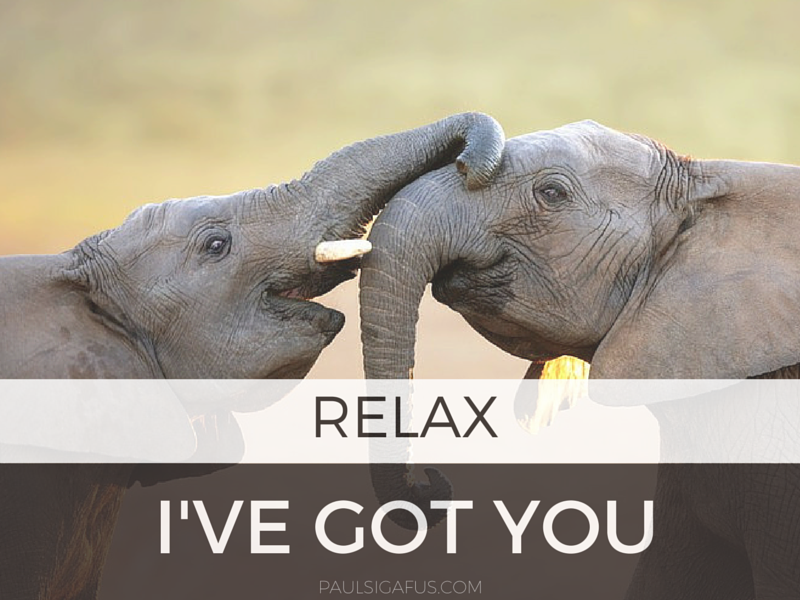 “Relax—I’ve got you,” I’ll encourage. Even when they’re afraid, I’m still there, ready to support them. I feel renewed as I apply the same trust in my own life. Right now, I’m focusing less on “solving” my dilemmas by my own hard work, and more on trusting the Divine to hold me up in my deep waters. Although nearly all of my earlier questions remain, they’re not so burdensome right now. I’m not wrestling elephants. I’m rediscovering sources of renewal that transcend my struggles— beauty, love, friendship, patience—and I’m remembering that these things deserve my attention too. Maybe you ﬁnd yourself caught up in what feels to be an urgent struggle. Maybe you’re trying to prove something, to ﬁgure something out, or to change something that seems immovable. Or maybe you’re just trying to cope. Under any of these circumstances, chances are that just trying harder on your own won’t solve your problem. “But I can’t just blithely set this aside,” you say. I hear you: sometimes there’s great purpose in staying engaged. Even so, couldn’t you beneﬁt from taking at least a half-­step back, and allowing a little more room for love, beauty, time, friendship, or grace to support and nourish you? Trusting in anything outside of yourself can feel scary and unfamiliar—but while swimming in the deep waters of life, we all need to be held up; you are no exception. So please consider the invitation to grow in trust, and to relax a little—and then wait in patience to discover the loveliness of being held up by power that is not your own.